We recommend you book as early as possible. Some tours tend to fill up very quickly. You can contact our reservations department at 613.723.5701 or 1.800.267.5288 or your local travel agency. How much of a deposit do I have to pay to book on one of your tours? We require a $100.00 deposit plus optional Cancellation/Trip Interruption insurance at time of booking. Air packages and “No Fly” Cruises require a $950.00 deposit plus optional Cancellation & Trip Interruption Insurance at time of booking. We highly recommend the purchase of Travel Insurance to protect You and Your Travel Investment. We offer a selection of Cancellation & Trip Interruption Insurance and Medical insurance options through Manulife. Our agents will provide you with all the options. 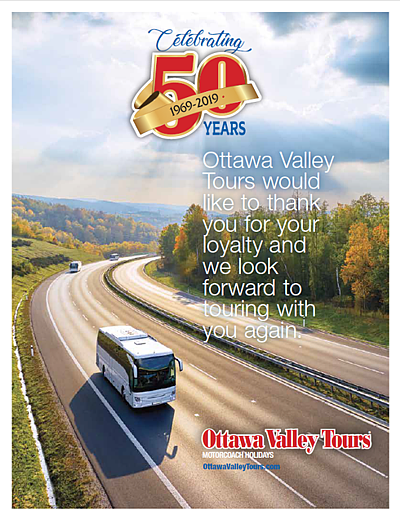 Seats are assigned as per the date you make your reservation on Ottawa Valley Tours. The earlier you book the closer you will be to the front of the coach. You can take 1 large suitcase and 1 small carryon on our tours. We offer a 5% Early Booking bonus if you book and pay in full at least 60 days prior to departure. Excludes One Day Tours, Air Packages and “No Fly” cruises. We accept Cash, Debit, Cheque, Visa or Mastercard. If I am travelling alone do I have to pay a single supplement? We offer single rates for all our tours. When will I receive my travel information? We send out the travel information 2 weeks prior to departure with your pickup time, hotel name and telephone numbers and seat number for our tours. Can I leave my car at any of your pickup locations? We have no reserved parking at any of our pickup locations. You would be leaving your vehicle at your own risk. We recommend arriving by taxi or have a relative or friend drop you off and pick you up.